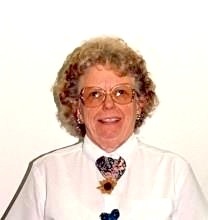 Alva Maria (Lundberg) Arnold, aged 87 years, beloved wife, mother, and grandmother, died at Brookdale Retirement Living in Overland Park, KS, on Thursday, February 23, 2017. The cause was complications following a stroke. Alva was born on February 21,1930, in Providence, Rhode Island, to Carl M. Lundberg and Hulda E. Peterson. She had one sister, Ann (Lundberg) Tillman of Warwick, Rhode Island, now deceased. Alva married Peter Kent Arnold on September 17, 1952. The couple had two sons, Peter Kent Arnold Jr., and Richard Edward Arnold. The family lived in several states including New York, Georgia, Connecticut, Maine, and finally, Olathe, KS, where they resided for over 30 years. Alva worked as a school lunchroom cook part time for 15 years, but her main labor of love was homemaking. She was a fabulous cook who also maintained vegetable and flower gardens. Alva sewed many beautiful quilts and was a member of the Olathe Quilt Guild for many years. She and Peter also took a number of cruises throughout their years together. Survivors include her sons, Peter, and grandson Nathan Arnold, of Olathe, KS, as well as her son, Richard, along with his wife Robin, and grandson Tim and granddaughter Stephanie Arnold, of Blue Springs, MO. Alva was preceded in death by her husband, Peter (d. 2011). Services will be held at 2:00 p.m. on Saturday, March 4th at St. Aidan’s Episcopal Church, 14301 South Black Bob Rd., Olathe, KS. Relatives are welcome to attend the service. The burial will be held in private. Memorial contributions are welcome and should be mailed to St. Aidan’s Episcopal Church, 14301 South Black Bob Rd., Olathe, KS 66062.